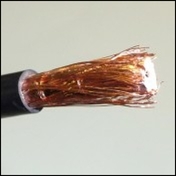 When attaching CoAx plugs it is always worthwhile slightly kinking the centre core of the cable (before you assemble the plug) so as to maximise the chances of good contact between it and the plugs centre pin. 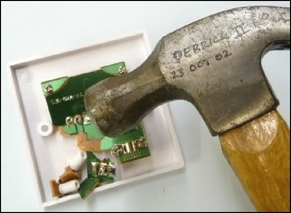 Some people recommend soldering this connection but I`m not sure it`s really necessary or advisable, it`s probably more likely that you will just melt/deform the plastic centre spacer rather than adequately solder the centre core ! A better idea than soldering is to lightly crimp (to crimp, posh word meaning to squash) the centre core of the Co-Ax plug at the bottom end near the insulator. It is not unknown to get a loose fit between the CoAx plug and the socket because the tolerance required to get it snug is extremely fine. A few minutes with some verniers revealed that a difference of just 0.05mm was enough for a reasonable fit to become a loose one, and that`s half the diameter of the average human hair ! It should be noted that it isn`t the fit of the outer barrel which is primarily responsible for a tight or loose plug, it`s usually the fit of the centre core into its female equivalent on the socket. So the solution to a loose plug is reasonably straightforward, slightly crimp the plug`s centre core (this is good practice anyway, see above), and/or the female equivalent on the socket. 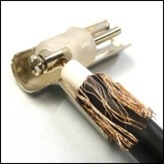 Only in exceptional circumstances is it necessary to gently squeeze the CoAx plug barrel [or the socket it`s going into] so it`s slightly oval. Before you attach the plug, thread the cable through the screw cap ! After trimming back the cable (as above) insert the centre core into the screw clamp and tighten to make good contact, though not too much that you cut the end of the wire off, or shear the screw...... Then assemble both sides of the metal plug and the top and bottom plastic cover, finally clamp it all together by screwing on the cap. Also see crimp on v screw on F connectors and "silcone grease". Note our F connectors are easier to use. then withdraw plate from its mounting. Now smash up the plate, preferably using “Derrick the Decider II”. If Derrick is unavailable, gently toss crappy surface plate into the biggest deepest bin you can find, then have the bin emptied as soon as possible. and fit it as per instructions above. * They`re only a few quid, so don`t be tight, get your hand in your pocket all you parsimonious peoples of the planet. Such is Derrick`s renown that he has turned from a noun into a verb, like Hoover. If something requires despatching we say “I`m going to Derrick it”, then, after the deed, “it`s been Derricked”. * Derrick is the second person to hold the title. Derrick the 1st was slain whilst deciding whether we should spend any more time trying to repair a Hitachi TV, that was way back on the 23rd of October 2002 AD. It was particularly poignant because he was so young, only 20 months old in fact. Still, the king is dead, long live the king. Derrick the 2nd, truly the king of the hammers. Trim back the cable as in the picture, arrange the outer braiding along the top and bottom of the cable so as to maximise contact with the screening can. If using a spacer plate feed the cable through it now ! Undo the rear screening plate/clamp and hinge it upwards, note the fibre washers on the screws, their function is to stop the screws falling out (and being lost in your deep pile carpet….). Insert the centre core through the screw post and tighten, not too much that you screw straight through the wire..... Shut the screening door and tighten the two screws, try not to overtighten and crush the cable excessively. Note, if short of clearance in the mounting box (due to the screening can requiring more clearance) then spacer plates are available. Remove the screened triplexer (or Quad plate) can from the face plate, noting which way round it was ! 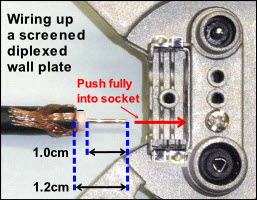 Remove the clamp bar and slacken off the screw in the right hand socket (left if viewed from the back), the left socket is unused (apart from in the Quad plate). 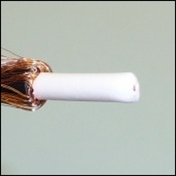 Trim the cable as in the picture and arrange the outer braid underneath so as to make maximum connection with the can. If using a spacer plate feed the cable through it now ! Insert the centre core as far as it will go into the socket then fully tighten the screw, though do not overtighten. Replace the clamp bar and tighten down onto the cable, not so far that it crushes it flat. The clamp will end up at a slight angle, but that is OK. 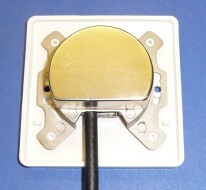 Replace the can on the surface plate, ensuring it`s the right way round ! 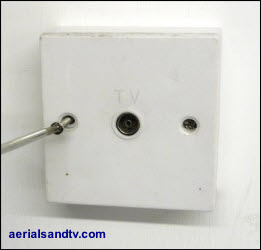 The TV outlet is the male, and yes I agree with you, that`s stupid, but that`s how they`ve been designed ! 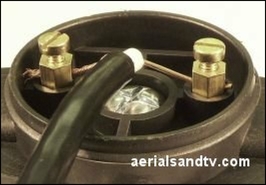 Remove cap from dipole and push the cable through the hole. Now, and only now, trim back the cable as in the diagram. Try to fold the outer braiding under the cable so as to maximise contact with the balun PCB. 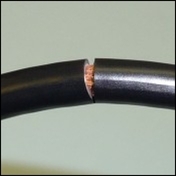 Tighten all screws firmly but not too far that they shear off the centre core or excessively crush the cable. Replace cap, and then tape the cable to the aerial such that is is in a downward direction where it exits the dipole cap, so as to minimise the possibility of water seeping in. Our DAB aerials, the DY14 Mk2 and the XB16s have similar dipoles. 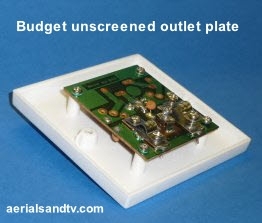 Rear view of one of our screened triplexed (or Quad) surface plates. Rear view of one of our screened plates. You can buy cable stripping tools, but I have to say most aerial installers don`t use them, which must tell its own story. I`m unconvinced by them myself, and, along with most installers, prefer to use the method below. Two things to bear in mind, the sharper the knife the better, if it`s sufficiently sharp then just touching the outside of curved cable will be enough to split it (unless it`s cold......). Secondly, try to ensure as little of the screening braiding is removed as possible. Using a sharp knife, cut lightly all the way round into the cable`s outer insulation, but not all the way through to the braiding below. Pull off the outer insulation you`ve just cut (split) off. Fold the screening braids back over the cable`s insulation. 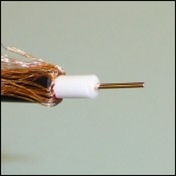 Note how decent cable has a foil, preferably a copper foil. Remove the foil, assuming you haven`t got crap cable, in which case you won`t have a foil..... Note, the foil can cut your finger! 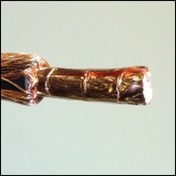 Cut through the insulator and remove it to expose the centre conductor. Connect up the aerial as in the pictures, having fed the unstripped cable through the hole in the cap, and then stripped it as shown above..... Generally it doesn`t matter which wire goes to which terminal, but some say, in the case of a Half Wave dipole, the element connected to the centre core should go at the top, my advice is to experiment. After wiring up replace the cap, and then tape the cable to the aerial such that is is in a downward direction where it exits said cap, so as to minimise the possibility of water seeping in. Push the cable all the way through the bottom boom and out at the far end. Note 1 : From a signal point of view it makes no difference whether the bottom or top boom is used to run the cable (depending on which way up you install the aerial). It does look marginally neater through the bottom boom. However, some say that routing it through the top boom will very slightly lessen the possibility * of water in the end F connector coupling (outside installs only, unless you`ve got a particularly leaky roof…..) but this difference is insignificant compared with the difference you get by tilting the aerial up a few degrees at the front end, which we strongly recommend. Note 2 : If a red plastic component is fitted to the aerial this can be dispensed with, it`s purely a marketing addition and serves no purpose at all. * The theory being that only water running down the top boom can get onto the F Conn coupling. But any water running down the bottom boom will still get onto a coupling, it`ll just be the “non F conn” stub coupling onto the boom, and this matters just as much ! Basically this is all irrelevant, tilt the front of the aerial up a few degrees then you`ve no worries either way…..
Now recut the cable (so the end is square) and attach the F connector (supplied) as described above. Next screw the F connector onto the F socket on the PCB, then carefully, but firmly, push the PCB assembly into the twin booms of the aerial. Clip the weatherpoofing cap over the end of the aerial, and, finally, don`t forget to direct the cable downwards (at the clamp end of the aerial) using the supplied plastic bung. We recommend that when installing the Log36, or any Log Periodic aerial, the front end is tilted a few degrees up, see below. 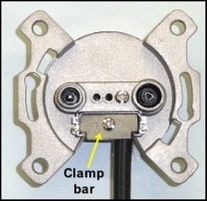 The FM Half Wave dipole and FM Folded Dipole both have 1in booms and generally come with the above clamp, which fits all poles between 1in and 2in. It will be noted how the aerial`s mounting boom can be rotated to change polarity. 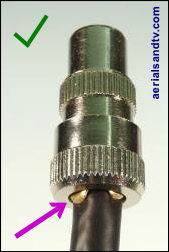 The picture on the left shows the aerial mounted on a 1in diameter loft kit, the right hand picture showing it on a 2in pole. It must be admitted it`s a tight fit on the latter, but it does fit, as the above picture proves ! 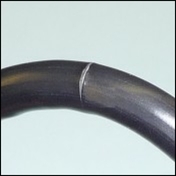 Some people recommend splaying the screening strands back over the “claw” (see picture on the right), as opposed to folding them back over the insulation and under the claw, as above. 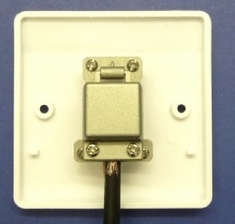 Theoretically this puts the cable`s screening directly in contact with the body of the plug. On the other hand it`s messier, and personally I can`t remember ever having a problem with the “conventional way”. and then you make your own mind up. 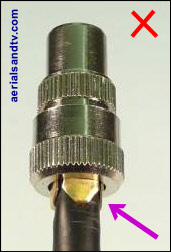 Do not over tighten a CoAxial plug if you want to maximise the strength of the claw, i.e. make it harder to pull off ! Do not screw up the collar as far as that in the picture on the left because the jaws on the claw are then free to bend outwards. 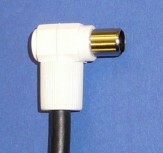 The plug on the right is tightened to the optimum with the collar holding the jaws onto the cable. Derrick is a valued member of staff whose decisions are always correct and final. His original job was to decide whether or not we should continue spending time trying to repair any recalcitrant recon TV (for sale). If the set was taking up far too much time and still not repaired, we`d ask Derrick whether we should spend any longer on it. 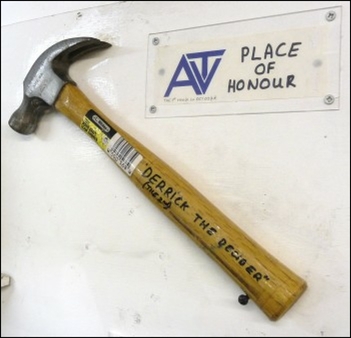 Derrick must have saved us hundreds of hours in labour over the years, thus he has a place of honour on our wall. Log Periodic Aerials : tilt them up at the front ! We recommend that all Log Periodic aerials are tilted up a few degrees at the front end (installed outside, this is not relevant for loft installs). Some say this can occasionally help with interference suppression (and the fact they`ve got a wide acceptance angle) but, more importantly, far more importantly, it helps to keep water out of the junction box at the front of the aerial. Both the models of DM Log we sell are supplied with tilting clamps to easily facilitate the necessary elevation. As far as I`m aware the DMs are the only Log Periodics on the market with tilting clamps. “slacken off the wing nuts [even better, replace them with plain nuts ! ] on the supplied clamp, push the front end of the aerial up, then retighten the nuts. If the front of the aerial sags back down repeat the process but pushing the front end up further, repeat until a few degrees of tilt are present”. Now, call me cynical if you like, but I think ensuring the front of a Log36 is tilted up slightly probably involves bending the aerial a little……. Not that I think that would do anything particularly harmful to it or its performance. 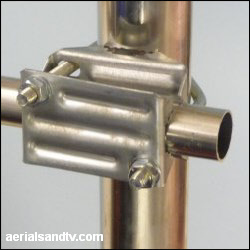 Some customers actually tilt the pole on the slots in the bracket which then introduces the requisite slight upwards tilt on the aerial. On the subject of keeping water out of aerial junction boxes I have to say I think trying to stop water getting into them is very difficult. Obviously you do your best to limit water entry but it can be so difficult to stop all of it 100% that I`d recommend an alternative approach and that would be to ensure that any water that does get in there drains out easily, plus you want to discourage damp. You do that by drilling drain / breathing holes in the bottom of the junction box. 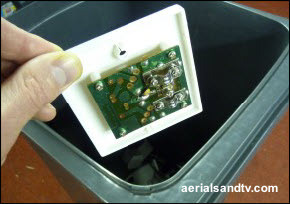 The reason why aerial manufacturers don`t tend to do this is that aerials can be used vertically or horizontally polarised and therefore they don`t actually know which is going to be the bottom of the junction box ! You, on the other hand, do know, so can take the appropriate action ! NOTE : if there`s a mast head amp (being fed by the line power) in use below the aerial that eliminates the problem because no current should get through that, unless the mast head has a “cascade” facility, which hardly any do. * or, in the case of Log Periodics, the aerial itself. Remember for Logs the signal and current path is actually down the boom. So it travels all the way back, round the rear clamp and back up again. And all Logs have alloy booms and steel clamps = dissimilar metals. 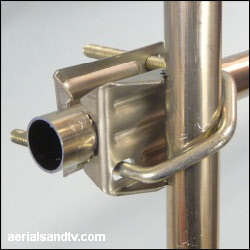 Why I prefer saddle and clamp connections (as above) over F connectors on Yagi aerials. NOTE : These instructions do not apply to Proception diplexed plates. 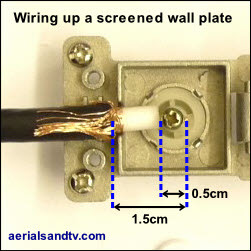 However, they are even easier to wire up and cable stripping dimensions are provided on the rear of each plate. NOTE : these pictures are of the Log40, the Log36 only has the front (smallest) elements on one side, then a gap to the next set. NOTE : I have seen some “quality” screened plates (even some MK ones…) which are unscreened, and it`s sometimes difficult to tell from the brochure as they often only show the front ! Self wired Log36s and all the Log40s. Note : the self amalgamating tape is not required for loft installs ! 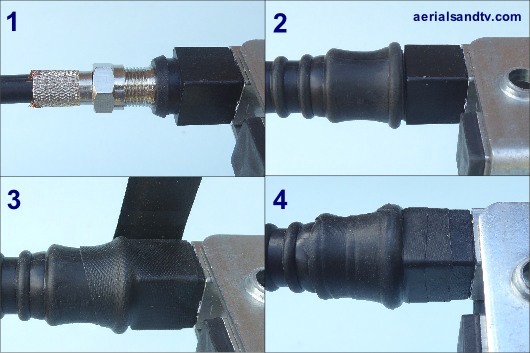 The pictures below are fairly self explanatory, but also see how to strip CoAx cable and how to install an F connector. In Jun 2018 the self wired Log36 was discontinued, a retrograde step in my view because I don`t fully trust F connected aerials* because the “boots” are not 100% waterproof. Thus we supply 1ft of self amalgamating tape with our Log36s (excluding loft install kits), though 6” of self amalg is actually more than enough. We supply 1ft so you`ve got some spare if you make a bollox of using it the first time or you need to rewire the aerial for some reason. In either case be very careful removing the old self amalg, do not damage the boot beneath. Anyway, the first job is to cut off 6in of self amalg ! When wrapping the self amalg stretch it to about half its width and overlap it by about half a width. NOTE 1 : We recommend that when installing the Log36, or any Log Periodic aerial, the front end is tilted a few degrees up. NOTE 2 : Hard wired aerials do not require self amalgamating tape, provided the cable, where it exits the balun cover, is angled downwards. 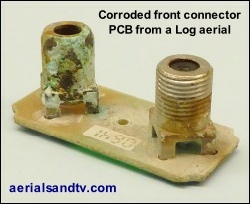 * if we get a choice we always sell hard wired aerials, e.g. 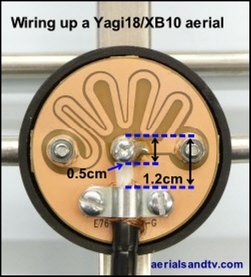 the Yagi18K, which is the next aerial up, (gain wise) to the Log36.